I’m certain that back in the early seventies when Richard O’Brien, a struggling actor/horse-riding stuntman from New Zealand was sitting in his tiny flat writing a musical that was to be put on in the Royal Court’s tiny Upstairs theatre, he couldn’t envisage that over 40 years later The Rocky Horror Show would not only still being performed around the world but would have become theatre’s biggest cult musical of all time. As part of the 45th anniversary of the show, it’s touring the UK having started in Brighton last December finishing in Richmond in November having been in 19 venues in between, including The Wimbledon Theatre where it’s playing this week. I can’t imagine that anyone interested in musicals hasn’t seen this at least once and if they haven’t seen it on stage, they would have seen the movie version which came out in 1975. So, to describe the plot would be superfluous but in case there are people reading this who haven’t seen it, here’s a very brief synopsis: After the opening song “Science Fiction Double Feature”, sung by a movie theatre usherette, somewhere in middle America, the newly engaged Brad and Janet are forced to stop their car when it gets a flat tyre and the couple take shelter in a grand, gothic mansion which is owned by transvestite Frank N Furter aided and abetted by his servants Riff Raff and Magenta. There are also various phantoms around the place, the delivery boy Eddie (who meets a very sticky end), Columbia, Frank’s girlfriend and Rocky who Frank has created a la Frankenstein. Both Brad and Janet are seduced by Frank before Dr Everett Scott appears who seems to be an ex-Nazi but with connections to the FBI. If this sounds confusing (and it is a bit), the plot is explained by The Narrator who turns up at various times during the evening to address the audience and tell them what’s going on. 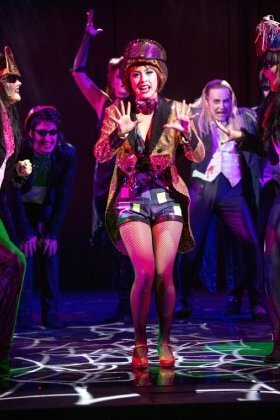 The Rocky Horror Show although set in America is ostensibly British, being part Carry On and part Hammer House of Horror with a bit of panto thrown in which is possibly one of the reasons it failed on Broadway. It’s rude, lewd and occasionally crude and the campest thing around. It’s become a real cult, with audience members dressing up as characters from the show and shouting out comments – it’s a raucous night at the theatre unlike any other. And of course, you get to do “The Time Warp” – it’s irresistible. This production stars Strictly Come Dancing’s Joanne Clifton as Janet and Ben Adams as Brad. The two work really well together and have a lot of chemistry which may be because they’ve just come off a long tour together in “Flashdance”. Stephen Webb plays Frank with the right amount of camp aggression in his corset, fishnet stockings and high heels. Riff Raff is sinisterly played by Kristian Lavercombe who has now played the part over 1400 times and he’s supported by the delightful Laura Harrison as Magenta who also doubles up as the Usherette. One of the standouts in the cast is Callum Evans who plays Rocky in a tiny animal print thong! He not only sings superbly but as an accomplished acrobatic gymnast, he does some incredible gymnastics and leaves the stage walking on his hands! Dom Jolly as The Narrator has to think on his feet as most of the audience’s comments are aimed at him and he deals with them at one-point firing back that he knew that Wimbledon was common. Incredibly, 45 years later, Hugh Durrant who designed the original set at the Royal Court is the set designer for this production and it’s spectacular, using a giant reel of film to frame the gothic mansion where most of the action takes place. Also, Sue Blane who did the original costume design is back to design the costumes for the tour and judging by the look of them, she has a lot more than the budget of £400 she had back in 1973. So, if you’re anywhere near Wimbledon this week or can get to any of the other venues between now and November, get out your blonde wig, corset, fishnets and anything else you think will work and go and see The Rocky Horror Show – it’s the most fun you can have with your clothes on – even if you don’t dress up.